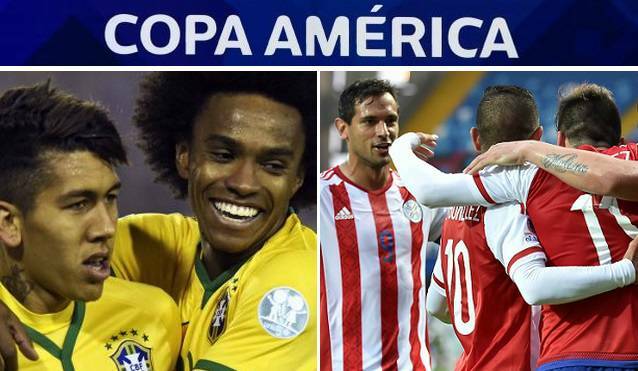 Copa América 2015 Brazil Vs Paraguay Quarter final 4 Live Score Streaming Preview :- Brazil will face Paraguay to secure the victory in the 4th quarter final match 2015 Copa America at Estadio Ester Roa, Concepción, Chile on 27 June. Brazil won twice and lost 1 game in the group stages of the on going copa america which ensured their place in the knockout stages as group C winners and now they will be facing unbeaten Paraguay who finished runner up behind Argentina in the group B after drawing two matches and winning 1. Brazil Playing XI: Jefferson; Alves, Miranda, Thiago Silva, Luis; Elias, Fernandinho; Willian, Coutinho, Robinho; Firmino. Paraguay Playing XI: Villar; Caceres, Da Silva, B Valdez, Piris; Bobadilla, Ortigoza, Benitez, Molinas; Valdez, Barrios.